WinRAR, one of the best file compression which must be instaled in every PCs of the day. This software doesn't only support for file compression but also able to diminish the file's size and usable in every windows version, from windows 98 to windows 7. Some say that WinRAR isn't as fast as his competitor, WinZip in file compressing. However, it's true but WinRAR will give you more service which at the end of the compressing process, you will get smaller archive file significantly. WinRAR allow us to save the archive in .ZIP or .RAR formats with various option to accelerate the compressing process and diminish the archive's size. 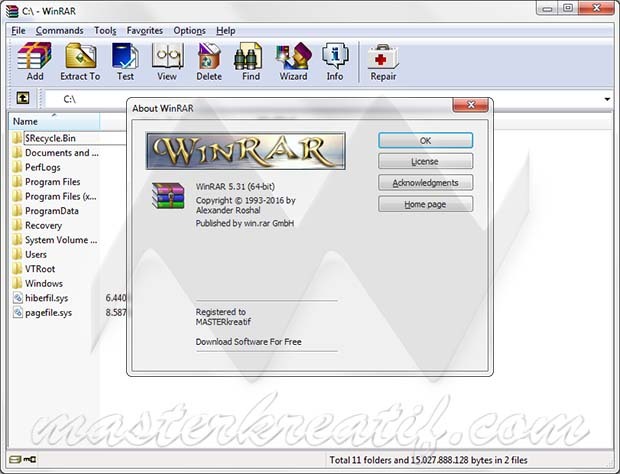 Eventhough some new comers will get confuse of numerous options and settings in WinRAR, but the inter-face will help you a lot. There's a system based on wizard which led you to discover the compressing process. I love it .!!! Your website is awesome, great content, one of the best website I have ever visited .It has very useful features and content.